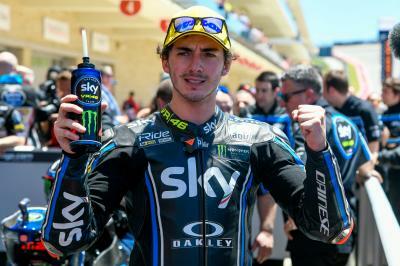 Franceso Bagnaia (SKY Racing Team VR46) took a tremendous second victory of the season at the Red Bull Grand Prix of the Americas to take a ten-point lead in the Championship standings, grabbing the lead mid-way through the race from second place finisher Alex Marquez (EG 0,0 Marc VDS) after a battle royal. The Spaniard saved a couple of scary moments during the race, but he still managed to hold off a late charge from third place man Miguel Oliveira (Red Bull KTM Ajo). Marquez got the holeshot from pole position into Turn 1, with Mattia Pasini (Italtrans Racing Team) and Bagnaia tucking in behind the Spaniard from fourth on the grid. 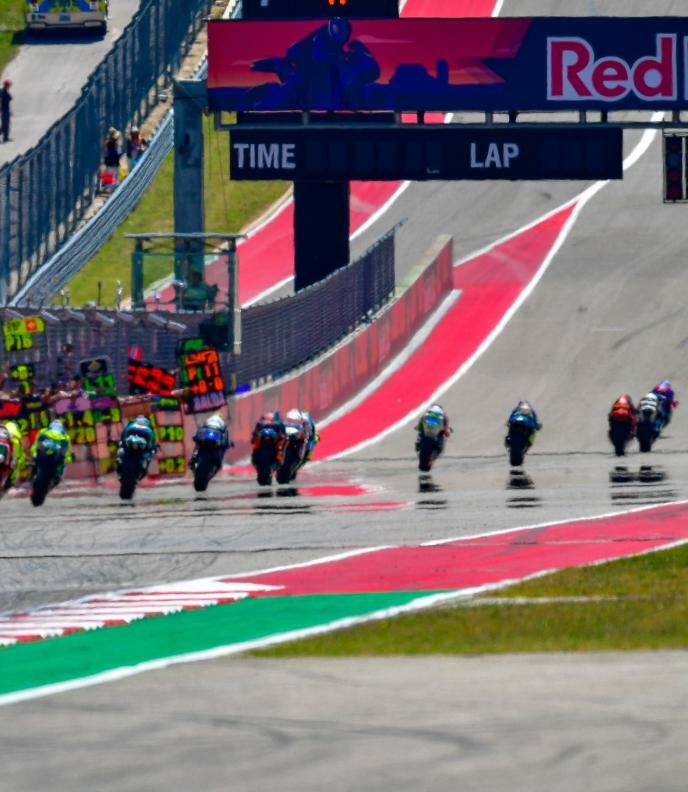 There was a slight tangle at the first corner, as Luca Marini (SKY Racing Team VR46) made contact with Joan Mir (EG 0,0 Marc VDS), who in turn tagged Dominque Agerter (Keifer Racing) – with Mir dropping to 24th. Sam Lowes (Swiss Innovative Investors) then took a tumble early, the former winner at the track lowsiding out and able to remount but out of contention. Marquez, meanwhile, pulled the pin in the early stages, with Pasini and race winner Bagnaia having a close battle for second, the latter getting through at the end of the back straight. 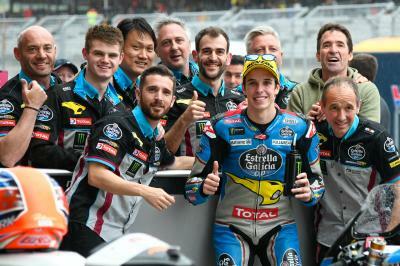 The Italian veteran seemed to struggle to find grip in the early stages of the race – losing touch with Bagnaia and falling into the hands of a gaggle of riders behind, the first being Xavi Vierge (Dynavolt Intact GP). In that gaggle were the two Red Bull KTM Ajo riders of Oliveira and Brad Binder, carving their way to join the battle, while Iker Lecuona (Swiss Innovative Investors) was also right in the mix. The battle behind Marquez and Bagnaia was in full swing, with Marcel Schrӧtter (Dynavolt Intact GP) leading the group before a nasty high-side coming out of Turn 1 ended his race. 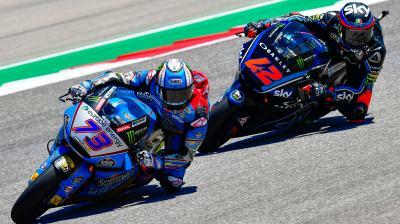 Back at the front, Bagnaia got past Marquez on lap 13, before the scrapped it out and staged a stunning battle that saw them change places six times on the same lap – until the Italian managed to get past and keep it, then starting to pull away. Vierge then crashed out on lap 14, the German low-siding at Turn 19 in the battle for fourth – rider ok.
Marquez then had a huge moment at Turn 18 with a couple of laps to go, pushing hard to hold off the rampant Oliveira who was closing in a second a lap. 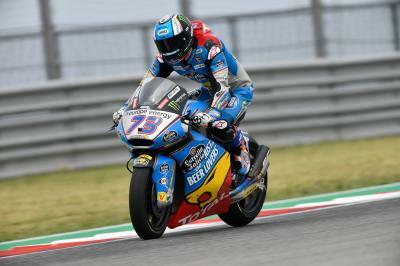 There were fireworks also in the battle for fourth, with Mir, Lucuona and Binder scrapping – Mir making up 20 places after his first corner troubles. At the front though, there was no stopping the number 42, who stormed to victory in the end by 2.464 seconds – with Marquez holding off Oliveira for second. Mir came home a stunning fourth, as Lecuona pipped Binder to the line for fifth and the South African had to settle for sixth. Championship leader Pasini came home seventh, while Jorge Navarro (Federal Oil Gresini Moto2) took an impressive eighth after starting 19th. Aegerter recovered to P9 in another storming ride after the trouble at the start, with Championship protagonist Lorenzo Baldassarri (Pons HP40) rounding out the top ten. The Moto2™ riders now head to Jerez, with Bagnaia taking the lead in the Championship – but Marquez was unstoppable in Andalucia in 2017. They’ll be back on track on Friday 4th of May! Free Video: Marquez and Bagnaia pass and re-pass!